A process flow chart is a process analysis tool which maps out a process and its steps through a set of standardized flow chart symbols. The process flow chart is an initial step in process re-engineering and continuous improvement/kaizen initiatives that help understand the different process steps, the sub-steps within these and the nature of these steps. It is a similar approach to value stream mapping where the value stream of a product or service is mapped from raw materials to customer distribution. Some process flow charts can be very complex and used in engineering design and plant designs, these are usually known as schematic diagrams and use a different set of symbols and provide more detail of the process. The symbols are used to represent a value adding task (a rectangle), an arrow represents a material / WIP movement, a square with a rounded side is the symbol for a delay, and an inverted triangle represents an inventory holding area. 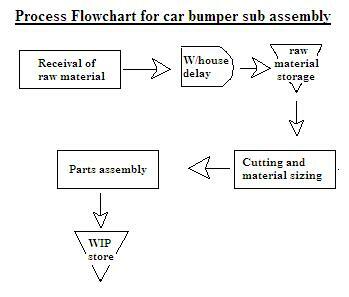 Please refer to here for further explanation on process flow chart symbols The process flowcart can contain a variety of information, depending on its intended use and complexity. It is up to the user to collect the required information to put on the flow chart. The items above are the main reasons why process engineers or industrial engineers involved in improving process performance will map a process or value stream with a process flow chart. Lean teams also use them for similar reasons and as a basis for their kaizen initiatives to identify sources of waste to eliminate to make any process more efficient.